Helen and Peter Wright from Grassy Spur Olives in Stony Creek scooped the pool in the Class 1 - Single Estate (minimum 200 litres per oil) with three of their extra virgin olive oils receiving Gold awards. Their varietal oils being Picual, Coratina and Frantoio were recognised as having outstanding qualities. The Picual oil went one step further and won the "Best of Class 1" award which shocked Peter and Helen Wright; it was a stunning achievement. To add to their surprise and to thunderous applause, their Picual oil was also announced as "Best Extra Virgin Olive Oil of the Show" ahead of an oil that won Gold at the prestigious New York Extra Virgin Olive Oil Competition recently—you can't do better than that! Lyn and Andrew Jamieson from Golden Creek Olives in Fish Creek were delighted to attract a Gold award for their estate-grown and processed Arbequina/Picual blend and Bronze awards for each of their Leccino and Frantoio varieties also in Class 1 - Single Estate. Both businesses have consistently received awards on a National level for their extra virgin olive oils. 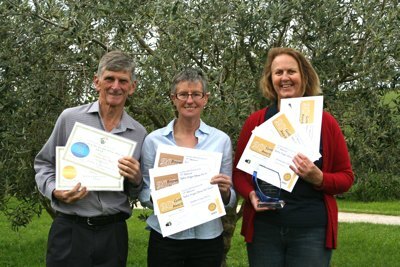 These awards confirm what local Southern Gippsland Olives growers have believed for four years now; that the soil and climate of South Gippsland consistently produces great extra virgin olive oils with aroma and taste characteristics that are amongst the best in the Australia.